The drug fasudil, approved in Japan for cerebral vasospasm and stroke, inhibits an enzyme that stabilizes cells’ internal skeletons. 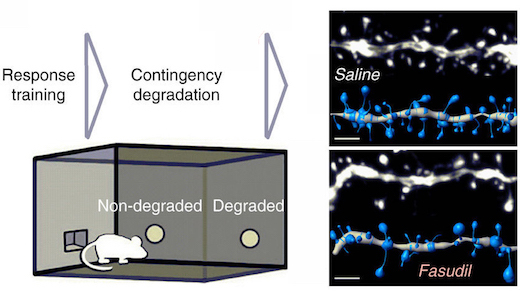 In mice, fasudil appears to slightly reduce the density of dendritic spines in a region of the brain that is important for learning new behaviors. This promotes goal-directed rather than habit-based behavior. Adapted from Swanson et al Nat. Comm. (2017), via Creative Commons. The results were published on November 30 in Nature Communications. "Some habits are adaptive – for example, turning off a light when you exit a room – but others can be maladaptive, for example in the case of habitual drug use. We wanted to try to figure out a way to help 'break' habits, particularly those related to the highly-addictive drug cocaine," says Gourley. She and former graduate students Andrew Swanson, PhD and Lauren Depoy, PhD tested fasudil in situations where they had trained mice to poke their noses in two chambers, based on rewards of both food and cocaine. Then the researchers changed the rules of the game. The mice had to learn something new, in terms of where to poke their noses to get the reward. Pairing Rho kinase inhibitors with cognitive behavioral therapy in humans could be an effective pharmacological adjunct to reduce the rate of relapse… Given its favorable safety profile and our evidence that it can mitigate cocaine self-administration, fasudil is a strong candidate, with the caveats that we envision it administered as an adjunct to behavioral therapy and potentially during early phases of drug withdrawal. This research was supported by the Emory Egleston Children's Research Center, the National Institute of Mental Health (MH101477), the National Institute on Drug Abuse (DA015040, DA034808, DA036316, and DA036737) and the NIH Office of Research Infrastructure Programs (P51OD011132, primate centers).